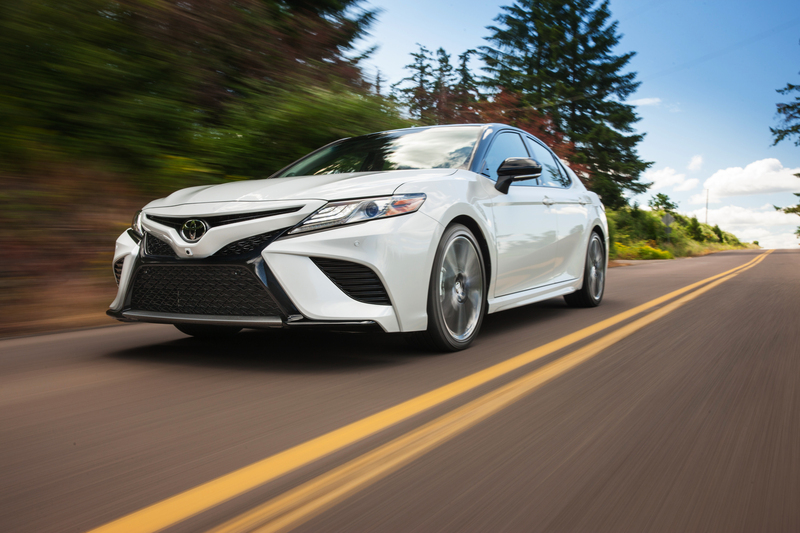 The 2018 Camry LE (MSRP starting at: $27,490) receives several upgrades as standard, compared to the previous generation model. These include the Entune 3.0 Audio system, a larger 7” Display Audio system, eight-way power adjustable driver’s seat, 17” alloy wheels, and more. Other standard features include air conditioning, a 4.2” multi-information display, chrome inner door handles, steering wheel-mounted controls for the audio system and multi-information display, map lamps, 12v power charging outlet, power adjustable and heated exterior mirrors with integrated signal lamps, a 60/40 split fold-down rear seat to maximize cargo-carrying versatility, dual vanity mirrors, an anti-theft system, LED signal lamps on the power folding mirrors, LED tail lights, and more. Standard safety features include Toyota Safety Sense P, the Toyota Star Safety System, 10 airbags, a back-up camera, tire pressure monitoring system, and more. Order the Camry LE with the available Upgrade Package (MSRP starting at: $29,990) to benefit from additional Entune features including Safety Connect, plus Sirius XM Satellite Radio, an 8” Display Audio system, additional safety and convenience features, and more. Or order the Camry L (MSRP starting at: $26,390) – an all-new model offering Canadians a new entry point into the Camry line-up that’s surprisingly well-equipped with comfort, convenience and technology features. The 2018 Toyota Camry Hybrid LE (MSRP starting at: $31,290) features Entune 3.0 Audio, a 7” Display Audio system, dual-zone automatic climate control with humidity sensor, heated front seats, a 4.2” multi-information display, steering wheel-mounted audio system and multi-information display controls, keyless entry with hatch release, the Smart Key System with Push Button Start, 12v accessory power outlet, anti-theft system, 17” alloy wheels, and more. The 2018 Toyota Camry XLE (MSRP starting at: $34,890) features the Entune 3.0 Audio Plus system, Sirius XM Satellite Radio, an 8” Display Audio system, dual zone automatic air conditioning, leather seating, eight-way driver and six-way front passenger power adjustable seats, 7” multi-information display, leather wrapped steering wheel and shift knob, integrated garage door opener, the Smart Key System with Push Button Start, a wireless charging system for compatible personal electronics, the Back Guide Monitor Alert, Blind Spot Monitor, and Rear Cross Traffic Alert safety systems, 18” alloy wheels, a panoramic moonroof, premium LED headlamps and rear combination lamps, LED daytime running lights, and more. The 2018 Toyota Camry XLE V6 (MSRP starting at: $40,690) delivers the additional power of the 3.5L V6 engine. This model includes the same standard equipment found in the XLE grade, plus several upgrades – including a Entune 3.0 Premium Audio, a JBL Synthesis Audio System, a 10” Head Up Display, the Bird’s Eye View Monitor safety system, and more. The 2018 Toyota Camry Hybrid XLE (MSRP starting at: $40,990) builds on the LE model, adding Entune 3.0 Premium Audio, JBL Synthesis Audio System, leather seating, 7” multi-information display, 10” Head Up Display, leather-wrapped steering wheel and shift knob, leather door trim, LED cabin illumination system and LED rear seat reading lamps, a wireless charging system for compatible personal electronics, clearance sonar, Blind Spot Monitor and Rear Cross Traffic Alert safety systems, Bird’s Eye View Monitor, Rear Cross Traffic Auto Braking, 18” alloy wheels, Premium LED headlamps and rear combination lamps, the adaptive front lighting and auto levelling headlamp systems, and more. The 2018 Toyota Camry SE (MSRP starting at: $27,890) receives several upgrades as standard, compared to the previous generation model. These include the Entune 3.0 Audio system, a 7” Display Audio system, more horsepower, Toyota Safety Sense P, Bi-LED headlamps, eight-way power adjustable driver’s seat, a security system, automatic climate control, sport side skirts, LED rear tail lamps, power remote trunk release and fuel lid release, power windows with automatic up/down function on all windows, hill-start assist control, and more. These join a long list of standard features, including a sport grille and rear spoiler, sport-tuned front and rear suspension systems, steering wheel-mounted paddle shifters, sport seats clad in sport fabric material and leatherette trim, a 4.2” multi-information display, steering wheel-mounted controls for the audio system and multi-information display, dual vanity mirrors, map lamps, keyless entry with remote trunk release, 12-volt accessory power outlet, anti-theft system, tire pressure monitoring system with auto location, 17” alloy wheels, and more. Order the Camry SE with the available Upgrade Package (MSRP starting at: $30,790) to benefit from additional Entune features including Safety Connect, plus Sirius XM Satellite Radio, an 8” Display Audio system, additional safety and convenience features, and more. The 2018 Toyota Camry Hybrid SE (MSRP starting at: $33,990) receives several upgrades as standard, compared to the previous generation model. These include more horsepower, Toyota Safety Sense P, enhanced fuel efficiency, LED headlamps, 8” Display Audio system, 18” alloy wheels, drive mode select system, an electronic parking brake, the Entune 3.0 Audio Plus system, and more. The 2018 Toyota Camry XSE (MSRP starting at: $34,890) features the Entune 3.0 Audio Plus system, Sirius XM Satellite Radio, an 8” Display Audio system, paddle shifters, dual zone automatic air conditioning, leather seating, eight-way driver and six-way front passenger power adjustable sport seats, 7” multi-information display, leather wrapped steering wheel and shift knob, integrated garage door opener, the Smart Key System with Push Button Start, a wireless charging system for compatible personal electronics, the Back Guide Monitor Alert, Blind Spot Monitor, and Rear Cross Traffic Alert safety systems, 19” alloy wheels, a panoramic moonroof, premium LED headlamps and rear combination lamps, LED daytime running lights, rear spoiler, and more. The 2018 Toyota Camry XSE V6 (MSRP starting at: $39,690) delivers the additional power of the 3.5L V6 engine. This model includes the same standard equipment found in the XSE grade, plus several upgrades – including a JBL Synthesis Audio System, a 10” Head Up Display, the Bird’s Eye View Monitor safety system, and more. The 2018 Toyota Camry is the Camry that Canadians have always loved – but with more evocative styling, engaging, spirited performance, additional standard convenience and safety features, and even better fuel efficiency – in short, the Camry Transformed, for the better, in every way. The 2018 Toyota Camry and Toyota Camry Hybrid go on sale at Toyota Dealers across Canada this summer. For complete and up to date details and specifications, visit www.toyota.ca/camry.